Hillary Clinton is suddenly sounding a lot like Donald Trump, at least on trade. For months, Trump has slammed U.S. trade deals with Mexico and South Korea as "horrible" and "disastrous." He wants to fix them by placing hefty fines -- known as tariffs -- on goods coming into the U.S. from foreign countries that don't play fair. Now, Clinton says she's ready to impose tariffs too. 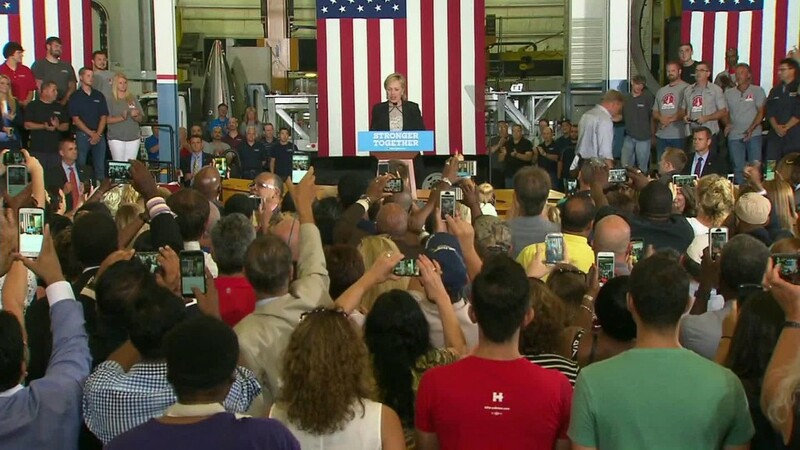 "When countries break the rules, we won't hesitate to impose targeted tariffs," she told the crowd at a manufacturing plant in Warren, Michigan. She said China and other countries have "gamed the system for too long." In addition to tariffs, she promised to ramp up the U.S. team that monitors trade. "I'm going to ramp up enforcement by appointing a new chief trade prosecutor, tripling the number of enforcement officers," she said. How big will Clinton's tariffs be? Notice Clinton said "targeted tariffs." She didn't go into detail, but that could become a key phrase. Experts have criticized Trump for saying he wants to impose tariffs as high as 45% on ALL goods coming from China. They say it's the wrong response because it hurts companies that do play fairly. Even worse, such a sweeping tariff would likely trigger a trade war that would sink the U.S. economy into a recession and cost millions of jobs. It's unclear how "targeted" Clinton plans to be. Both Republican and Democratic presidents have levied tariffs against foreign companies in the past. For example, President Obama has imposed a hefty tariff on some Chinese steel imports. But that's different than a tariff on all Chinese goods. The fact that Clinton devoted so much time in her speech Thursday to trade is telling. Americans are now split on whether they believe the U.S. should exit its trade deals, according to polls. On Thursday, Clinton went out of her way to stress that she is not supporting the controversial Trans-Pacific Partnership trade deal that President Obama has been pushing. "I oppose it now, I'll oppose it after the election, and I'll oppose it as president," she said. Is this really a shift in tone? The strong tone was noticed by union members and progressives who have been pushing her on trade. "These were Hillary Clinton's strongest words yet against the TPP," said Adam Green of the Progressive Change Campaign Committee. "For the first time, Clinton signaled she will personally work to kill the corporate-written TPP." The Trump campaign, however, fired back. "How's she going to get tough on China?" said Trump economic advisor Peter Navarro on CNN's Quest Means Business. He notes that some of Clinton's economic advisors have supported TPP or even worked on it.